I bought these gloves to use outside when I shovel snow. They help keep my hands warm but not as much as I expected. ProsThey help warm my hands in wintry weather. ConsThey are a bit large . I used the heated fleece gloves for the first time last night.It did keep my hands pretty warm and the material is soft and comfortable. I will be using it more often as we faced these below zero temps every winter. ProsWarms up easily.Material soft and comfortable. 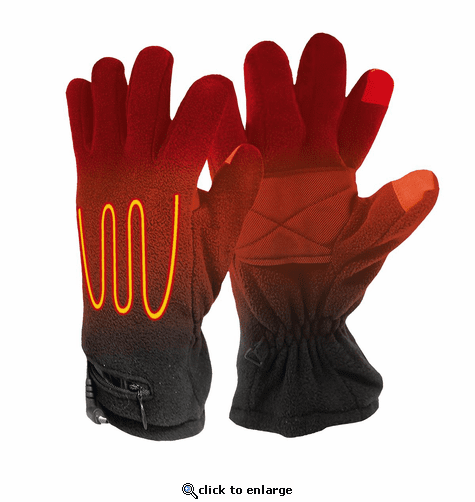 The build quality is good but there are no heating elements in the fingers of the gloves. This has a pad in the palm and on the back side of the glove. The fingers are a bit long for my girlfriend so if a small is truly needed understand that small/medium will seem a bit big. This makes them very difficult to use for everyday tasks but they will still warm the hands. They are adequate for the price. ProsInexpensive. Works with standard AA size batteries including rechargables. ConsUses only 3 batteries per glove, no heating elements in the fingers.